If you are a fun of "Game of Thrones" TV series you should definitely book this guided tour which will take you to the filming locations of the series. 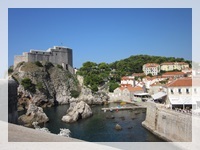 With expert guide, you'll get to know the fictional city of King's Landing while exploring Dubrovnik's Old Town. The popular HBO TV series, adapted from George Martin's A song of Ice and Fire novels, documents a war waged by several noble families for Seven Kingdon's Iron Throne in the mythical and of Westeros. The tour begins at Pile Gate, just outside the city walls. On the tour you will visit Lovrijenac Fortress - the beautiful 11th century castle that features heavily in many of the Game of Thrones battle scenes and gaze down at fictional Blackwater Bay from the fort's impressive vantage point, and imagine the bloody Battle of Blackwater taking place outside of its walls. 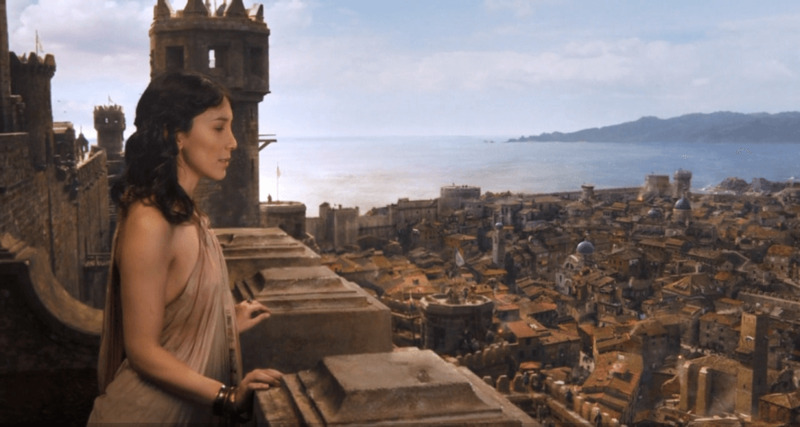 You will also climb the city walls that were attacked by the Baratheons in the first series. In addition to the city walls and streets, your guide will also introduce you to several city parks that were used to film countryside scenes. After three hours this tour ends near the start point at Pile Gate. If you have more time than you should book upgraded "Game of Thrones" tour which includes visit to Trsteno arboretum. After walking city tour in Dubrovnik you hop aboard a luxury minibus and travel with your guide to one of the oldest arboretums in Croatia. Used as the gardens of King's Landing palace during the third Game fo Thrones series, Trsteno is a key filming site as well as the home of thousands of exotic plants and trees. Trsteno Arboretum, located near Dubrovnik, represents the coastal gardens of King's Landing where Tyrion and Varys plan their schemes and deceptions. Trsteno landmark is the renaissance villa Gucetic-Gozze and garden area that has been grown since the 15th century to this day. This garden, together with the villa, an aqueduct, a mill and a baroque fountain depieting Neptune and some nymphs, and the pavilio - gazebo looking out towards the sea and surrounding islands - are the most beautiful example of garden architecture among all Dubrovnik villas. Gradac Park - Setting of the Purple Wedding between Margaery Tyrell and King Joffrey Baratheon. The wedding ceremony scene was filmed in Belfast, Ireland, while the grand celebration was filmed in Dubrovnik's Gradac Park. The park which is located in the surroundings of the old city centre can be reached by climbing century-old steps. When you reach the top you will be amazed by the splendid views of Dubrovnik. This historical park is famous for its lonc walking trails, its beautiful nature and the fountains in its centre with lotus flowers and goldfish swimming. Lovrijenac Fortress is the new scene for Red Keep and the bay outside its walls was used as setting of the sea battle at Blackwater where Stannis Baratheon tried to attack King's Landing and dethrone King Joffrey. Lovrijenac Fortress, also known as Dubrovnik Gibraltar, is a fort located on a cliff outside the city walls, on the western side of the city, 37 meters above the sea level. The fort is known as a scenic area and represents the historical symbol of Dubrovnik's resistance against the Republic of Venice. Pile is a meeting point for both visitors and locals and it represents the main entrance to Dubrovnik's Old Town. Located in Pile, with wonderful views of Lovrijenac and Bokar towers, you will find and old wooden drawbridge that leads to the entrance of the city. From Pile you can also enjoy the views over a nearby small fishing harbour. All Pile corners have been used as settings during previous seasons of Game of Thrones. Walking along the seaside wall towards west you will reach Bokar Fort which defended the entrance to the city as well as the bridge and the moat in Pile. This semi-circular tower was created by Florentine architect Michelozzi in the 15th century. Dubrovnik's Bokar Fort was used in Game of Thrones series as King's Landing seeting in seasons 2 and 3. Minceta Tower - the highest point of Dubrovnik walls is a large circular tower. 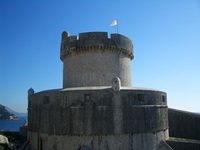 It is also the most prominent defensive point facing inland and it is a symbol of the Republic of Dubrovnik. it is the place where Khaleesi Daenerys Targaryen walks around trying to find the entrance into the House of Undying. St Dominic street, located near the monastery and Dominicans church is one of the most beautiful streets in Dubrovnik's Old Town, and it leads to fort Revelin, located at the east entrance of the city, known as Ploce. In this street were filmed the market scene, as well as the murder of King Richard's biological sons and the Gold Cloaks scenes during the second season. Battle scenes for the fourth season of Game of Thrones series were filmed in Belvedere Hotel's atrium, which still awaits restoration and is located at the eastern entrance of Dubrovnik, in Saint James suburb. 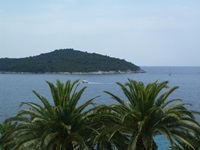 The island of Lokrum was used as a setting for exterior scenes. This island was first mentioned in 1023 as a place where a Benedictine abbey and a monastery were established. According to a legend, Richard the Lionheart found shelter on the island of Lokrum, after his ship wrecked when he was returning from the Crusades in Palestine. as a sign of gratitude he donated a sum of money in order to build the city cathedral.